Our newest addition breaks down his creative process and gives a bit of insight into the tools he uses. 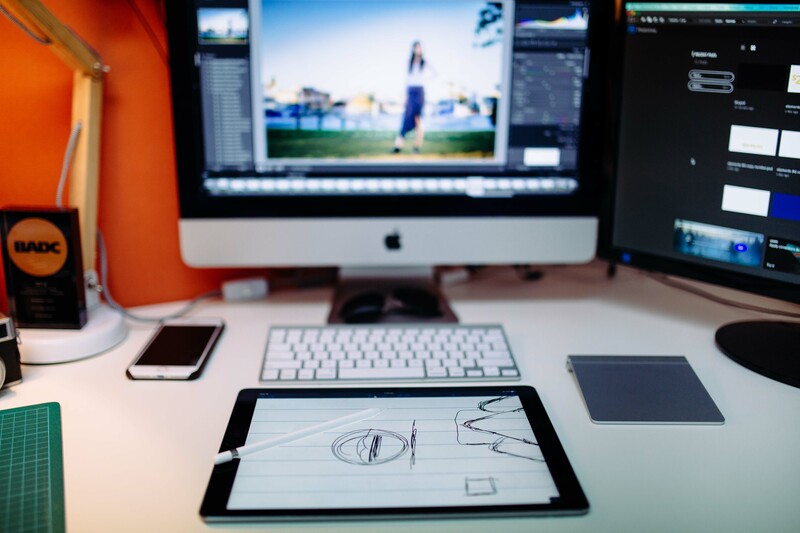 • To make stuff I use a 24” iMac (with dual screens) plus Apple’s magic trackpad and the iPad pro. • To shoot stuff I use a fuji x100, plus a few canon 5D’s and assorted prime lenses. • I’ve always got a 2L bottle of water sitting on my desk that I feel guilty about never drinking. • When I need a bit of shhh I’ve got a rundown pair of seinheiser HD202’s. • And most importantly, a drawing of ‘Mummy and Daddy’ by my daughter, that reminds me why I get out of bed in the morning. A lot depends on the project but i like to spend a bit of time on research first, checking out the brand or project and what the market looks like, then circling back to the brief to check on deliverables. From there I’ll move straight into sketching and mockups for a few hours before taking a break to let ideas grow. When I return I’ll get a good gauge if initial ideas are winners… or if I need to drink more coffee and go back to the drawing board. Once things are ready to present I love to get in a room with the clients. This face to face meeting helps frame ideas better than an email and allows us to gauge clients reactions. The whole process needs to be collaborative to be a success, so I’m usually on the phone with the clients or regularly talking with our account managers to ensure we are delivering exactly what the client needs. Music is my go to. I love discovering new stuff but when I need to focus I’ve got a few albums I’ll play endlessly like Kid A by Radiohead or Relationship of Command by At The Drive In. Use the colour guide below to help formulate your brands palette.